COURT COMMAND (AUS) (Bay 2003-Stud 2008). 6 wins-1 at 2, AJC Stan Fox S., Gr.2. Sire of 169 rnrs, 107 wnrs, inc. SW Win Smoothly (Macau Lisboa Prelude, L), SP Pepperano, Rocket Commander, Court's Star, Nicked and Court, Pisces Star, Sunshine Blaze, Total Authority, Best Command, Bullish Friend, Fifth Column and of Blaze Forth, Courtside, Little Critter, No More Mistakes, Bay Road, Fortini, Girls Command, Kodacommand, Laurinoor, Multimax, etc. Bingham (g. by Distant Music). 6 wins to 1300m, A$130,775, 2d VRC Maribyrnong Trial S., L, 3d VRC Bulban H., MVRC Omega Smeg H., VRC Bob Davis 2YO H., MVRC Fisher & Paykel H.
Tunes of Gold (f. by Distant Music). 2 wins-1 at 2-at 1200m, 1500m, BTC Brisbane Bloodstock Bonus 2YO H., 2d BTC Kompletekokoda.com.au 2YO H., Home Buyers H., GCTC Sushi Wine Bar Starcraft H.
Western Front. 2 wins at 1400m, 1600m in 2014-15, TTC Weeding Hire P., Admiral H., 3d Devonport RC Replays at Tasracing.com H.
Global Glamour. Winner at 2 in 2015-16 in Aust. Golden Success. 4 wins at 1200m, 1400m, 2d BRC Poolrite P., IGT P., 3d BTC 4BC Peter Psaltis H.
Stagecoach. 3 wins at 1000m, 1200m in Aust. As Bad as Tyson. Winner at 1000m in 2015-16 in Aust. As Good as Tyson. Winner at 1000m in Aust. Ruthless Secret. Winner at 2 in Aust. Chamber of Secrets (f. by Desert King). Winner at 1000m, 2d SAJC Pepsi Max 2YO P., Schweppes 2YO H.
Heavens Own (f. by God's Own). 2 wins-1 at 2-at 1100m, 1200m in Aust. Cent to be Good (f. by Exceedingly Good). Winner at 1100m in Aust. SAM SUNG A SONG (Timber Country). 7 wins from 1000m to 1600m, A$323,250, AJC Liverpool City Cup, Gr.3, City Tatt's RC Lightning H., L, AJC Smith & Nephew Genesis II H., Maytag H., San Miguel H., STC Darley Guineas Day H., 2d STC Festival H., L, AJC Santa Uses a Canon Camera H., STC Hyland Race Colours H., Sydney Horse Festival H., De Bortoli Black Creek H., 3d STC Starlight S., L, AJC Legion Welter H., 4th Hawkesbury Gold Cup, Gr.3. Sundial. 10 wins to 1100m, A$115,850, BTC Bin 555s H., Doomben Dash H., Wyndham Estate H., QTC Sierra Queen H., Tony Fitzgerald H., Divide and Rule H., 2d BTC Triple M Welter H., 3d QTC JM Gray-Buchanan H.
Western Toll. 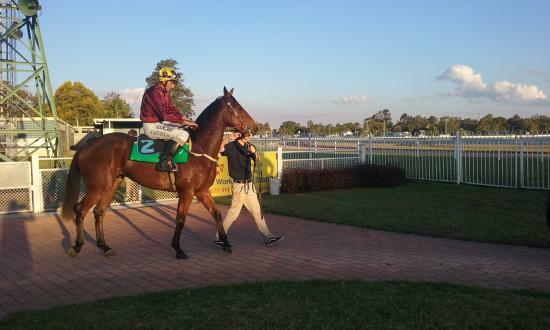 7 wins to 1100m, BTC Manikato H., Doomben H., QTC Jack Delaney H., 2d BTC Western 4x4 Northgate H., Tobin Bronze H., QTC Hot Reception H.
Trumpadal. Winner at 2, WATC Westspeed Nursery H.
Western Cent. 5 wins. See above. Sky Apolla. 11 wins to 1350m, BATC Transit Tours H., QTC Leopard Gum H.
ROCKET TO GLORY (Shovhog). 14 wins-5 at 2-to 1400m, A$849,875, to 2014-15, BRC Chief de Beers H., L, Qantac Pty Ltd H., Geon Group 2YO P., Makers Mark H., Rohrig Group H., 3d Qld Tatt's RC Tattersall's 150th Anniversary S., Gr.3, BRC Keith Noud H., L, Clarence River JC Ramornie H., L.